Pulp and Paper from Finishing Technology, Inc.
MASS FINISHING COMPOUNDS from Finishing Technology, Inc.
Plus, many of our compounds also work in spray wash applications for cleaning, corrosion inhibiting, descaling procedures and special rinses; as well as for waste treatment uses. Acidic Burnishers – To meet a wide spectrum of specifications, our family of burnishers can deliver against a wide range from light to heavy cleaning/brightening requirements, and can be used on any nonferrous alloy. In some applications, they can also be used on ferrous alloys. Because of the many ways burnishing is achieved, we have specifically designed some of our burnishers to be used with stainless steel, carbon steel, porcelain, sintered bauxite and plastic media. We have also formulated burnishers to meet more specific needs such as “cleaner” products that help facilitate the rolling and feeding of steel media. High Alkaline Cleaners - We have developed a variety of liquid and powder alkaline compounds designed for use on ferrous parts in vibratory deburring and barrel tumbling operations, where light to heavy duty cleaning is required. Our alkaline cleaners are designed to be compatible with any type of media, whether it be ceramic, plastic, or steel and are often used to provide “between process” rust protection. 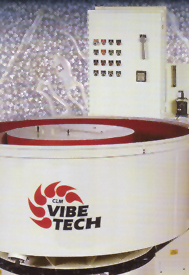 Mild Alkaline Cleaners - In vibratory applications where nonferrous parts need to be deburred and white rust is a concern, our mild alkaline cleaners can solve these challenges. When you face other ferrous applications where rust is not a concern, our mild alkaline compounds are an excellent solution, too. Plus, these products can be used in combination with either ceramic or plastic medias. 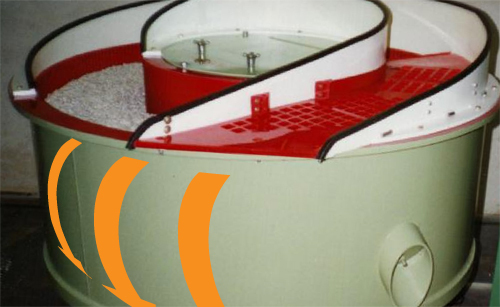 Corrosion Inhibitors – Our versatile corrosion inhibitors were created for use in simple dip tanks, low and high pressure spray-on applications and even vibratory operations. These specialty inhibitors will provide full coverage against white or red rust; and depending on the application, they can deliver operating concentration ranges from 5-20%, by volume. In a humidity cabinet (120ºF and 90% R.H.), our inhibitors will provide at least 100 hours protection. Parts Washing Compounds - We have designed parts washing compounds for many different applications including ferrous and nonferrous, light duty to heavy duty cleaning, low and high temperature, high pressure spray systems, aerated and/or agitated tank systems, and ultra-sonic cleaning. The corrosion protection that’s achieved with any of these compounds is generally 2-4 weeks at 5%, by volume, assuming completely dry parts from the process. Degreasers - Unlike other degreasers, this product can be used in spray bottles, in mop and bucket applications, and in floor scrubbers. It is safe on most surfaces including wood, concrete, paint, metal, etc., and can effectively clean surfaces at dilutions ranging from 1 ounce per gallon to 5 ounces per gallon, depending on customer requirements. With our experienced R&D team and laboratory onsite, we also can work with you to create proprietary products for your exacting needs in terms of performance efficacy and cost efficiency. Finishing Technology also has the manufacturing, mixing and filling capacity to deliver a broad range of volumes beginning with one gallon containers, and including totes, drums and even tanker truck loads; and carefully blended to concentrations that will meet your requirements. To learn more how our specialty compounds can solve your needs, call Fred Warmbier at 513-563-4333.